Subject: Clarification on revision of pension of Pre-2006 pensioners (JCOs/ ORs and Commissioned Officers)- delinking of qualifying service of 33 years for revised pension. Reference: This office Circular No. 568 dt 13.10.2016, 555 dated 04th Feb, 2016 and 570 dated 31st Oct, 2016. 1. Applicability for reservists (Cir 568) It may please be specifically clarified whether Circular 568 is applicable for Reservist pensioners. Reservist pensioners have never been equated with Regular Army personnel. Therefore, Circular No. 568 dated 13.10.2016 is not applicable for revision of pension in respect of Reservist pensioners. 2. Revision of pension of Recruits (Cir 568) Whether the Recruits (in army), Aircrafts man under training (in Air Force) and Apprentice (in Navy) are eligible for revision under Cir 568 dt- 13.10.2016 While revising the pension of Recruits in terms of Circular No.568 dated 13.10.2016, service element and disability element will be protected with Sepoy Group ‘Z’, since all tables are based on the minimum of the pay in the pay band plus grade pay as per Special Army Instruction 1/S/2008, 2/S/2008, 3/S/2008 & 4/S/2008 corresponding to the pre-revised scale. However, the pension of Recruits will be revised according to lowest group of Sepoy i.e. ‘Y’ w.e.f. 01.07.2014 in accordance with Circular No. 555 dt 04.02.2016. In other words, pension of such Recruits will be payable from 01.01.2006 to 30.06.2014 for the Sepoy group Z and thereafter for Sepoy of Group Y w.e.f. 01.07.2014. 3. PSU absorbees (Cir 568) Whether the Circular 568 is applicable to PSU Absorbees who have commuted 100% of their defence pension and are now drawing 1/3rdI restored pension. If not, whether any separate order/circular will be issued for such category. Pension of PSU absorbees who have commuted their 100% pension to receive lump sum payment, will not be revised in accordance with Circular No. 568 dt 13.10.2016. Separate orders will be issued by the Govt and will be circulated on receipt of Govt order. However, the revision of pension w.e.f. 01.07.2009, 24.09.2012 and 01.07.2014 (under OROP) will be revised in the rank for which pensioned as mentioned in relevant orders / Circulars. Therefore, in the case of Sergeant GP-I having 15 years qualifying service, pension will be revised to Rs 9170/-from 01.01.2006 to 31.12.2015 and as per 7 th CPC revision, pension will be revised as Rs 9170x2.57 w.e.f. 01.01.2016. 5. MNS Officers (Cir 555 & Cir 568) Revision of pension for MNS officers is indicated in Circular 568. However, no revised pension for MNS Officers (Lt to Major) is indicated in Table 4 of Cir 555(OROP). Whether the PDAs can revise the pension of MNS Officers as per Cir 568 and directly proceed to VII CPC by multiplying the same with 2.57 The basic pension drawn by the officers of MNS as on 31.12.2015 may be revised under 7th CPC as per Circular No. 570 dated 31.10.2016. 6. Why additional pension is not payable on DE/WIE (Cir 570) As per Note to para 10 of Cir 570, additional pension is not payable on DE/WIE. This is not clear. As per Circular 570, DE/WIE is not revised and paid at the old rates with Dearness relief. Till date, additional pension is being admitted on DE/WIE. Therefore, when revision of DE/WIE has not been done and are still being paid at old DE/WIE rate on which additional pension pension on DE/WIE has been suddenly withdrawn. Note below Para 12 of Govt. letter No. 17(01)/2006-D(Pen/Pol) dated 30.09.2016 (Circular No. 570 dated 31.10.2016) may be referred to under which it has been mentioned that w.e.f. 01.01.2006, the additional pension will not be admissible on Disability Element/ Liberalised Disability Element/ War Injury Element/ War Injury Element of Disability /Liberalised /War Injury pension. 7. Difference in enhanced rate of family pension for MWO X as per Cir 567 & 568 In Cir 567, the enhanced rate for family pension is shown as Rs 10985/- (i.e. 10985/- (i.e. 21970/2). Whereas in Cir 568, the enhanced rate of family pension is shown as Rs 10895/- (i.e. 21790/2) Please confirm which is the correct enhanced rate of family pension for MWO Gp X. Matter is being examined. However, enhanced rate of Ordinary Family pension Rs 10895/- provided in circular no. 568 may be paid till receipt of necessary amendment in Govt. letter. 8. Applicability of 6th CPC & 7th CPC for Revision of pension for reservists who have granted ex-gratia pension as well as ex-gratia family pension. In terms of GoI, MoD letter No. 1(06)/2010-D(Pen/Pol) dated 22.11.2013 the amount of ex-gratia of Rs 750/-is being paid to Reservists and amount of Rs 645/- is being paid to the widows and dependent children of the deceased Reservists. No further Govt. orders have been received for revision of pension of these pensioners. Therefore, existing amount will be payable till receipt of Govt. orders in the matter. 9. Revision of pension to the Havildars granted ACP-I Pension of post-2006 Havildars granted ACP-I who were granted pension benefits of Nb-Subedar later on promoted to the rank of Hony. Nb Sub and whose Corr. PPO has been issued receiving the rank as Hony. Nb Sub Pension may be revised to the rank of Nb-Sub. Necessary Circular No. 566 dt16.09.2016 has already been issued in this regard. 10. Modified Parity for MNS(Local) & NCC MNS (Local) & NCC belongs to civil pensioners. Their revision orders are is sued by DOP&PW The orders for modified parity for revision of pension of MNS (Local) & NCC have been issued vide this office Civil Section Circular No. C- 144 dt 08.0 4.2016. 11. Recovery of DR @ 125% instead of DR 119% (Circular 570) Various PDAs have raised issues regarding recovery on account of payment of excess dearness relief and additional pension on disability pension and war injury element. (i) Recovery of excess amount paid on account of payment of DR @ 125% instead of DR 119% while working ou t disability element/war injury element may be withheld till further orders. (ii) Recovery of additional pension on disability element/war injury element p aid w.e.f. 01.01.2016 in respect of such pensioners who attained the age of 80 years and above may be withheld till further orders. Kindly refer Circular No. 574 dated 20.02.2017. 12. Revision of Pension in r/o DSC & TA (Circular No. 568) Is Circular No. 568 is applicable for revision of pension in r/o TA & DSC Para 10 of Circular No. 568 dt 13.10.2016 may be referred to in this regard. 1. All Havildars granted ACP-1 are getting pension equal to regular Nb Sub wef 01 Jan 2006 whereas Havildars after passing the JCO cadre course prior Jan 2006 granted Honorary Naib Subedars are getting pension of Havildars plus Rs 226/- only wef Jan 2006. 2. If ACP-1 Havildars having without qualification of JCO cadre getting pension of regular Nb Sub wef 01 Jan 2006 why the pre-2006 retirees are depriving benefits of equal pension in terms of para 5.1.62 of the recommendation of 6th CPC wef 01 Jan 2006? 2. All the Hony Nb Sub who retired on after 01 Jan 2006 are getting pension equal to regular Nb Sub but I am getting pension too less. Para 5.1.62 6th CPC and orders for notional fixation of pension dated 12 Jun 2009 both are effected from 01 Jan 2006 but it is seen that Hony Nb Sub who retired on after 01 Jan 2006 are getting pension of regular Nb Sub wef 01 Jan 2006 and those who had already retired before 01 Jan 2006 are being depriving from the benefits/financial hardship of the equalization due to the reason juniors are getting more pension than the seniors. Kindly look into the matter and give justice accordingly with reference to group, class, trade, cadre and length of service. 3. I requested/reported/brought into the notice of all higher authorities to give justice to revise my pension as per the recommendations of 6th cpc para 5.1.62 and Govt orders dated 12 Jun 2009 but it noticed that all are ruling that pre-2006 retirees are not elegible the revision. Is there any judicial authority to hear voice of the poor veteran who had putforth 27 years meritorious service in the indian Army? PCDA Circular No. 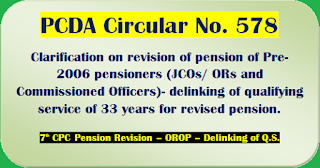 578 - Clarification on revision of pension of Pre-2006 pensioners (JCOs/ ORs and Commissioned Officers)- delinking of qualifying service of 33 years for revised pension. Clarification on Circular No. 568 dt 13.10.2016, 555 dated 04th Feb, 2016 and 570 dated 31st Oct, 2016.